Explore our site for answers and helpful information. Call us at (503) 209-0177 to setup a tour. Due to problematic behavior, no non-neutered adult male dogs will be allowed. Non Neutered male puppies will be considered on a case by case basis. Non-spayed females are allowed as long as they are not in heat. Call (503) 209-0177 to inquire about availability.In most cases we will be able to accommodate your needs. Christmas, Thanksgiving, July 4th, and other major holidays are busy times; call or email early to ensure availability. Existing Customer Reservations can be made here. New customers please refer to the "Getting Started" button. Normal check-in and check out times are between 7:00am and 7:00pm, 365 days a year. Schedule an onsite tour today by calling (503) 209-0177. See pictures of our facility and 4 legged clients here. For Daycare, we just need your dog on a leash. Most customers prepay to save time and money. We're happy to accommodate you on a pay as you go basis. Half days (5 to 6 hours or less) are $15 / Full days are $25. Payment is due at the time of drop off. Payment is due at time of pickup if the stay is open ended. If you return for your dog(s) earlier than planned, SafeJourney will refund or credit any unused portion of your fee. Payments can be made with our app or in-person using cash, check, or major credit card (Amex, Visa, Mastercard). Pay on this website in addition to our app and in person. Home-Style Dog Daycare. Dogs roam free, play, and socialize! All family dogs need a place to stay during the day. Your dog spends the day at our comfortable Victorian home with us and other pets. For your dog's protection, our home is climate-controlled and our yard is pesticide-free. We are open 365 days per year from 7am to 7pm in order to take care of your dog day care needs. Our dog day care customers are taken without a reservation on a first come first serve basis. 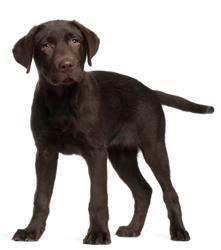 It is very rare that we are unable to take your dog but if you are unsure, simply give us a call. All dogs that are not going to be hand carried should be brought to our facility with a secure leash, collar and or harness. 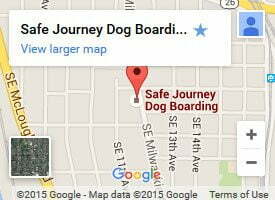 Our Portland facility is very secure once your dog is inside, but do please keep in mind that we are located on a busy street with lots of activity taking place throughout the day. Unfortunately, far too many owners do not pay careful attention to their own dog’s security! Please take a moment to make sure that your dog is fully secured for his or her short trip to and from your car. For those needing brief periods of dog day care, we have half day packages that cover periods of 5 hours of less. For those needing more, we offer full-day day care rates good for any time period over 5 hours between 7am and 7pm. Our single-use rates are $15 for a half day and $25 for a full day. However, we offer a number of pre-paid packages with deep discounts that can lower your costs to as little as $7.50 per half day and $10 per full day. 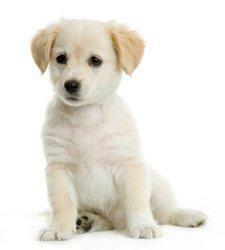 Typically, most day care dogs are fed either before leaving home, after returning home or both. We generally do not feed our day care dogs. However, some puppies and other dogs with special needs are on an eating cycle that includes a mid-day meal. If this is the case with your dog, simply bring his or her mid-day meal. A note will be made to our staff at check-in that your dog is to receive a mid-day lunch. For customers with disabilities or other difficulties bringing their dogs to the front door, we will make every effort to meet you for curb-side service in order to increase your convenience. If you are not on time for your pick-up or drop-off, call us while on your way. If need be, we can meet you and your dog at the curb. No need to get out of your car. No need to get wet. You can pick-up or drop-off in sixty seconds or less! 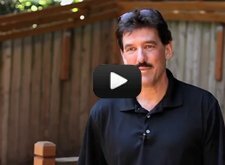 Hear owner, Craig Capley, speak about what makes Safe Journey Dog Boarding unique. Dogs roam free, play, and socialize! A funny and light-hearted tour of the facility given by the dogs themselves. Listen to the pups talk about all of the reasons why they love Safe Journey Dog Boarding. Learn some basic tips from an expert dog trainer on how to keep your dog from barking and doing other bad behavior. My dog was so happy at Safe Journey. He looks forward to another stay. The dogs were happy and having fun and not crated at all. Wonderful Service!